Good morning everybody! I'm trying to change the keyboard combination keys for my input source from "control+space" to "command+space" but it wont budge. System prefrences instructs: "To change a shortcut, select it, click the key combination, and then type the new keys. Now, either im an idiot, or this just dosent work. any help? You now need to click again on the shortcut alone at the far right. Then you will be able to enter a new shortcut by typing it. Not the answer you're looking for? 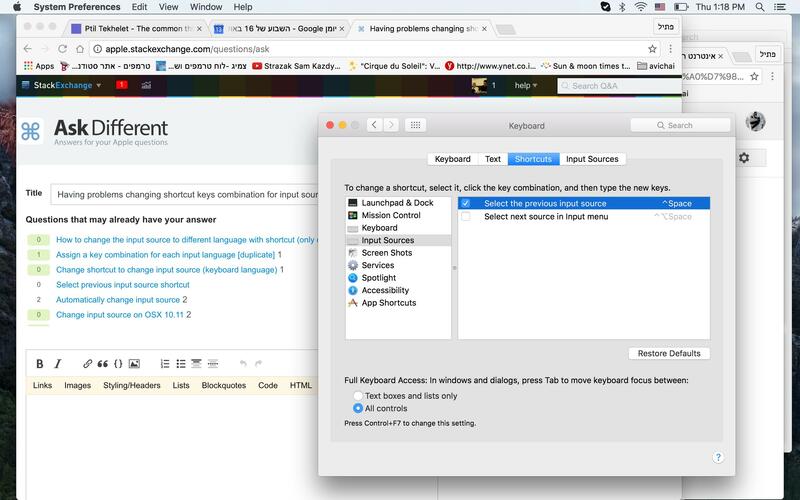 Browse other questions tagged macos keyboard shortcut text-input input-source . Keyboard Maestro interfering with control-tab action in browsers - how to disable? Can I control the order of keyboard layouts in the system menu?